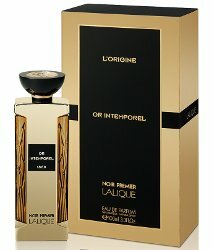 Lalique will launch Or Intemporel, a new addition to the luxury Noir Premier collection. Bergamot, Cardamom, Tobacco, Coffee, Vanilla, Patchouli... OR INTEMPOREL is a spicy oriental fragrance whose two, deliciously addictive, primary notes – tobacco and coffee – evoke the opulence of gold. Additional notes include pink pepper, rum, everlasting flower, myrrh, cinnamon, tonka bean and lorenox. Lalique Or Intemporel will be available in 100 ml Eau de Parfum.